Marlon: Festival loving 2 Berth Motorhome! 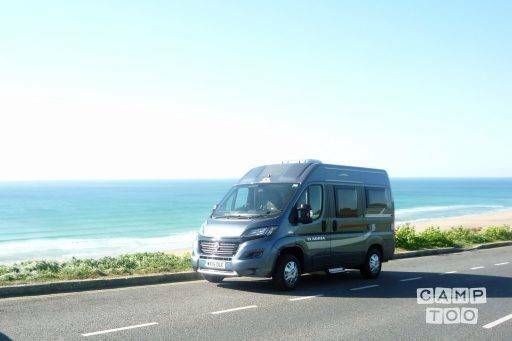 Marlon is one of Kernow Kampers more popular motorhomes and has been to festivals, events and Europe more times that us! Built on a short wheel base for ease of driving and double sliding doors to ensure maximum ease, safety and comfort whether in the UK or Europe we’re sure hiring Marlon will make you a very happy camper. This van is ideal for two adults or a young family to get away. The kitchen has a built in sink, triple hob, slow cooker and fridge, plus all the cooking equipment you need. The bathroom is well designed and features a clever fold away wash basin and shower combo and onboard toilet. For extra comfort the motorhome also has air conditioning/heating throughout and is fully winterised. The sleeping arrangements feature two wider than standard single beds that can be converted to a “U shaped” double. We offer additional add on options such as kayaks, bike racks, awnings, windbreaks please contact us for more information. Marlon is driveable on a standard licence for anyone 21-75 with two years driving experience and a clean(ish) licence. Dogs are welcome at a cost of £25 per animal per hire. A damage deposit is taken and pre/post rental checks made. The vehicle has a £1500 excess, in the event of damage or an accident this is payable by the renter. Full terms & conditions can be viewed at Kernow Kampers. Je kan de camper ophalen in Grampound bij Kernow. Je kan je auto hier gratis parkeren.